EURUSD grew towards 1.22 area within the first half of the month and it has started consolidating since then. 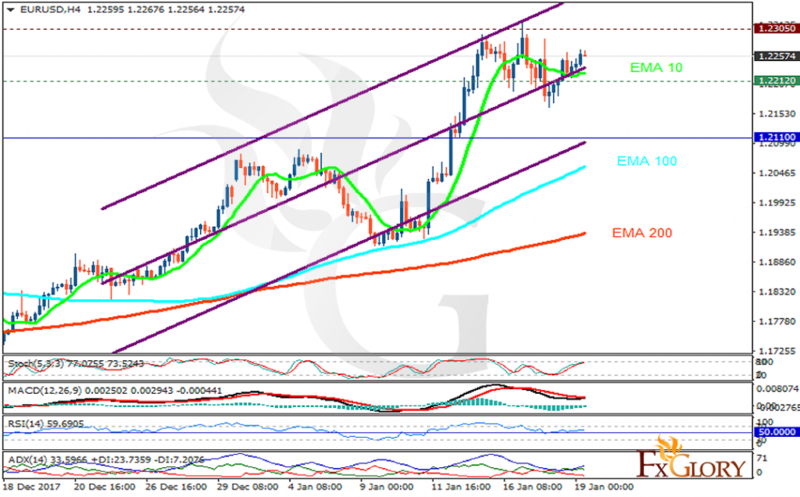 The support rests at 1.22250 with resistance at 1.22870 which both lines are above the weekly pivot point at 1.21100. The EMA of 10 is moving horizontally in the ascendant channel and it is above the EMA of 200 and the EMA of 100. The RSI is moving above the 50 level, the Stochastic is moving in high ranges and the MACD line is on the signal line in the neutral territory. The ADX is showing buy signal. EURUSD will be consolidating within the support and resistance zones with no significant movement.